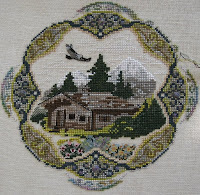 Northern Expressions Needlework: Spring is in the air! The high temperature for today is 10C. WOO HOO! It's only early March though, we still tend to get a good storm late in the month or even in early April so I wouldn't quite say that winter's over just yet. I can also tell spring is on the way, as my stitching ADD has returned. I'm loving working on Alpine Garden, though the chart is driving me to insanity. There is a large section of blackwork to come shortly, which is all in black on the chart. There is a picture insert that shows what colours are to be used where, but it's small and blurry. GRRR. I may just leave the whole section to the end and move on to the octagonal border instead. Anyway, here is where it stands after the first week or so. Considering that every half hour or so I get distracted and stop to do something else, or play with threads or put a new motif into a new design, I'd say it's not bad progress. The picture actually came out quite clear, the fabric is just a tad darker and the white and colours are just a bit brighter IRL. Speaking of the white, I didn't like the NPI white, it was just too cream for snow, so I replaced it with AVAS Blanc Optique, and I'm much happier with it. At the same time, my threads arrived for RIR and I really, really want to start it again. It's not really a new wip, since I already got about 1/3 of it done before, so I keep trying to justify the start that way. :D Also trying to justify it by the fact that it's Carrie's silks and I want to see how they stitch up, not just a couple of stitches. And since I got that great pink, and a couple of awesome blues which I really like for Taking Flight, I want to start that one too! I justify this as I don't currently have an over one project. AND since I picked out colours for Cirque des Triangles ages ago, I really, really wanna start that too. Plus it's over one AND on black! AND I want to start English Whitework because it's an entirely different technique - all specialty stitches and hardanger - and would give me some extra variety. AND I want to start Growth Rings, Bramble and Rose, Amtrack, Spanish Bleu, Time Well Spent.... the list goes on and on and on. Add to that that I already have at least a dozen that are over halfway finished and should probably work on before I start new stuff. AND my materials for the hearts sampler have shipped and should be here in the next week or so and I really don't want to get a day into another new one before they arrive and I drop everything. I have been dilligently working on selecting colours for the flower designs. The flower colours are definitely easier to pick than the greens. I had originally thought to use a single green for all the designs, but after a lot of playing I decided that was boring and I'd probably get bored of the same colour over and over. Plus, with some of the flowers being medium tones, some being pastel and some being really bright and bold, I need to balance them with the greens. So there will still be a lot of playing left to come yet. No rush, I won't be starting one until I get the hearts done, but I'd still like to get settled on colours and get them ordered soon since I already have the fabric for the first four.